Carpal Tunnel Syndrome is a syndrome that affects the hand and arm usually characterized by tingling, numbness and other signs and symptoms. 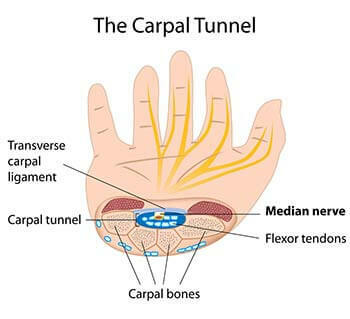 The Carpal tunnel is a narrow pathway located on the palm side of the wrist, which protects the median nerve (the main nerve) of the hand and the nine tendons that help the fingers move. Carpal Tunnel Syndrome is caused by a compressed nerve in the wrist. Many factors can lead to Carpal tunnel syndrome like certain underlying health conditions, possible patterns of the hand, the anatomy of the wrist, wrist injuries, etc. However, in many cases no single cause of the Carpal tunnel syndrome is identified. The signs and symptoms of this syndrome usually start and develop gradually over a long period of time. First, this syndrome is characterized by a numbness and tingling sensation in the thumb index finger or middle finger that comes and goes. Over the time these signs and symptoms become persistent, aggravate and are also accompanied by weakness of the hand and a tendency to drop objects. Characteristic is also the pain at night located on the affected wrist which interferes with sleep. A detailed anamnesis is necessary to help your health care provider diagnose this syndrome. Also, a detailed physical examination of your wrist, hand and fingers is necessary for diagnosis. X-ray of the wrist is sometimes necessary in order to exclude other wrist problems. Electromyogram is also sometimes necessary in order to exclude other wrist problems. With the help of this test, your health care provider will test and evaluate the electric activity of the muscles when at rest and contracted. Nerve conduction study is another diagnostic test which measures the passage of electric impulses in the median nerve through the carpal tunnel. It could also rule out other medical conditions that affect the wrist. The treatment of Carpal tunnel syndrome should be started as soon as possible, once its signs and symptoms appear. In mild cases, sometimes it is enough just to rest the wrist for a longer period of time or to avoid the activities that make these symptoms worse. Applying ice packs is also recommended in order to reduce the swelling that accompanies this syndrome. If after a few days or weeks, these methods offer no relieve of the symptoms, additional treatment is necessary. NSAID – drugs which tend to reduce the pain caused from carpal tunnel syndrome. Wrist splinting – which holds your wrist still while sleeping, relieving this way the sign and symptoms of this syndrome. If, still after non – surgical methods, the signs and symptoms of Carpal tunnel syndrome persist, surgical treatment might be necessary.